Ukraine may abolish its law on special local governance in the Donetsk and Lugansk regions, President Petro Poroshenko announced on Monday. The measure will be discussed at a meeting with the National Security Council, called by the president for Tuesday. 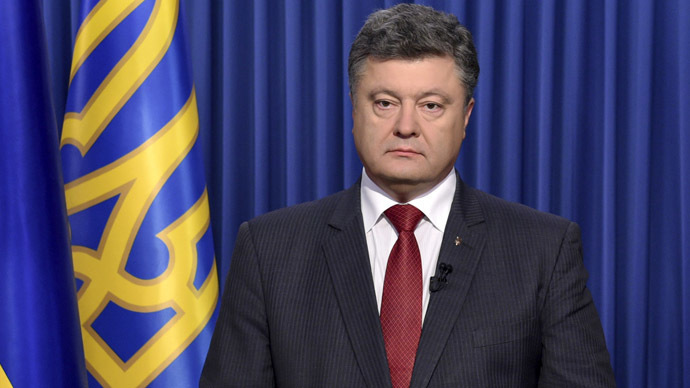 In his address to the nation, the Ukrainian president said that Kiev stays true to the Minsk protocol, but has to make amendments to the special status law, which was approved by the parliament on September 16. Ukraine is ready to adopt a new law on decentralization of power "if all sides get back to observance of the Minsk protocol," Poroshenko said. The protocol was approved in the Belarusian capital on September 5, with Kiev authorities and Donetsk and Lugansk militias agreeing on a ceasefire in eastern Ukraine. 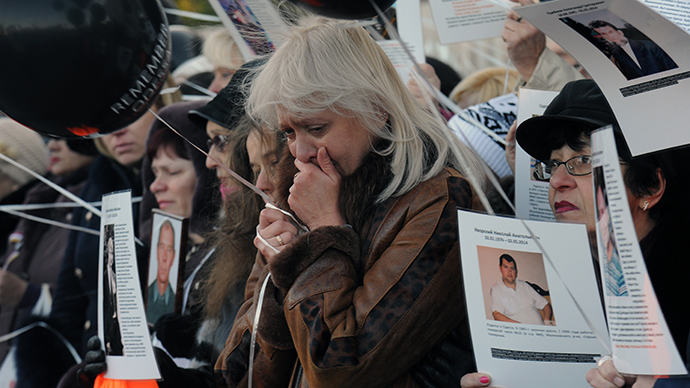 The contact group in Minsk agreed on other key issues, including the exchange of war prisoners and humanitarian aid access to the conflict zone. The document on special local governance in the Donetsk and Lugansk regions, signed by Poroshenko last month, outlined "temporary order of local government in certain districts," and suggested local elections in the districts to be scheduled for December. The self-proclaimed people's republics carried out elections this weekend. According to the vote's final results, incumbent PM Aleksandr Zakharchenko won Sunday’s elections in the self-proclaimed Donetsk People’s Republic in eastern Ukraine, taking some 75 percent of the votes. 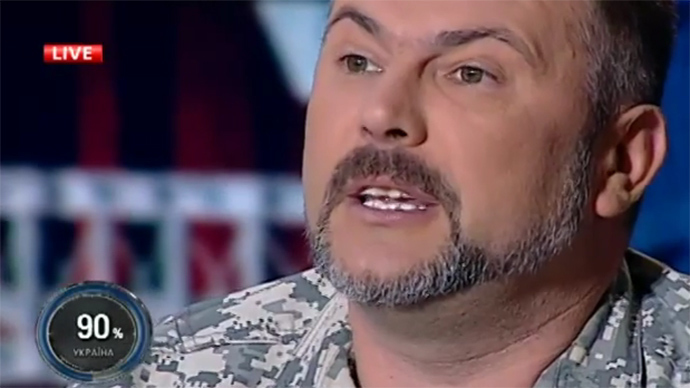 In Lugansk, 63 percent voted for the current leader, Igor Plotnitsky. In his address, Poroshenko said Ukraine did not recognize the elections in the regions, calling it a "farce at gunpoint" and a “terrible event that has nothing in common with the real expression of the people’s will." The vote "brutally violates" the Minsk agreements, Poroshenko stated, adding that the vote threatened to disrupt the peace process in the area. Representatives of the Donetsk and Lugansk regions have said they abide by the Minsk protocol and are ready to continue their dialogue with Kiev, should its officials "act in a sensible way." Moscow also believes the elections in the self-proclaimed republics were held in an orderly manner and in full accordance with the Minsk agreements. The Russian Foreign Ministry issued a statement saying that Moscow “respects the expression of will of the southeastern [Ukrainians],” stressing that Russia is ready to “constructively contribute” to solving the crisis in Ukraine. “The United States condemns the illegitimate, so-called 'elections' held on Sunday by Russia-backed separatists in parts of Donetsk and Lugansk,” said Bernadette Meehan, spokesperson for the White House National Security Council. 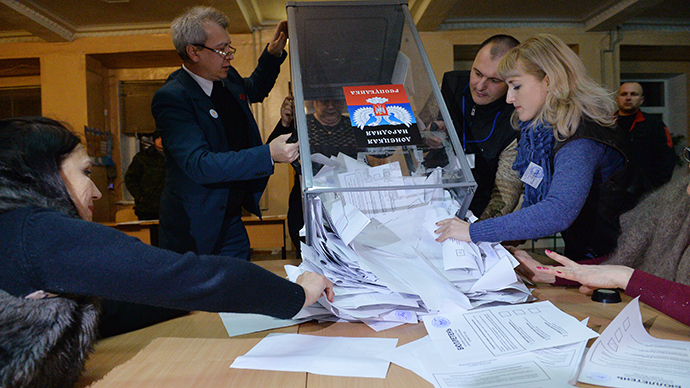 Ukraine held its early parliamentary elections on October 26. Moscow recognized the results of both votes. Earlier in October, Russian President Vladimir Putin said the law giving special status to troubled regions in eastern Ukraine was "not perfect," but might be used to finally stabilize the situation in the area. "Perhaps it's not a perfect document, but it's a step in the right direction, and we hope it will be used in complete resolution of security problems," Putin said after closed-door talks with Ukrainian President Petro Poroshenko in Milan.